Commissioned by HOME,University of Salford Art Collection, Tate, Zabludowicz Collection, Frieze Film and Channel 4. The present formula of TV debate is designed to corrupt the public judgment and, eventually, the whole political process. The American presidency is too great an office to be subjected to the indignity of this technique. Edel Assanti presents We are the people. 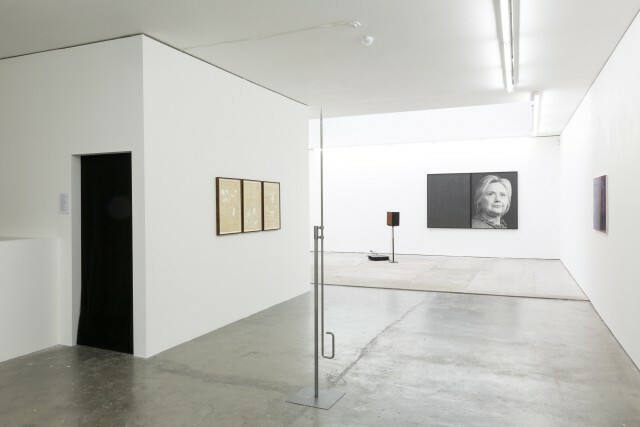 Who are you?, a group exhibition of eleven artists examining the current status of democracy. The exhibition explores the media and geographies of a sociopolitical space in transition, revisiting the contexts of public protest and the free press to question our shifting relationship with traditional liberal institutions. It simultaneously points towards new trajectories, in which the act of viewing con- tent has profound consequences, politicians materialize via holograms, and society worships data. When Marshall McLuhan asserted that the medium is the message in 1964, the world had just begun to comprehend the paradigm shift that had taken place in the first televised political debate. McLuhan’s phrase proposed that the medium of communication had a symbiotic relationship with the content that was being transmitted. His observation gains new currency in the 21st century, where old forums for political discourse seem progressively irrelevant, and the shape of debate has evolved to fit a new mould. A new debate has arisen around how opinions are constructed. Do technology and democracy exist in harmony, or conflict? Are we free agents, or “hackable” animals? How will liberal democracy adapt to this climate?